Futuristic styling matched to a new electric chassis platform make the Hyper SS roller the ideal choice for new entrants to the expanding electric 1/8th buggy scene. This affordable, competitively priced chassis retains many of thenew SS chassis and suspension features ready to accept your choice of electronics. The Hyper SS EP chassis can accommodate most of todays current crop of high performance brushless motors, speed controllers and LiPo batteries. The moulded battery tray features three quick release velcro straps perfect for 2S, 3S and 4S packs and also a raised platform to mount your esc off the chassis avoiding the chance of damaging chassis slaps off jumps. If you are looking for a different dual battery layout either side of the centre driveline, an optional battery layout package is available. The receiver is protected in a custom designed sealed box that features a servo housing mount for easy removal of electronics. 3-differential driveline features a steel centre spur gear and 16T steel pinion as standard, ready to handle the power of todays brushless motors. The aluminium adjustable motor mount allows for a wide range of possible ratios to suit popular motors and track sizes. Colour coded anodised aluminium chassis parts feature throughout along with HoBao's customary high quality suspension mouldings. Suspension is fully adjustablewith ride-height, droop, tow-in and camber all available for fine tuning. The newly designed front C-Hub suspension assembly provides a smoother drive and 17mm big bore shocks soak up all that is in their path and provide the perfectrace chassis at the fraction of the cost of other top line brands. Want to try electric 1/8th, but looking to spend less? Try out the Hyper SS Race Roller. 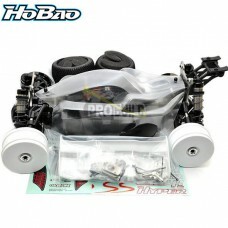 Requires electronics to complete - ESC, motor, battery, servo, reciever, handset and paint for body.